"You're done. I watched. In case you've forgotten, decorating was supposed to be a team activity. It was supposed to be fun." Okay, so I hooked this issue on two points. One it's a hole in my Flash collection I needed filled and two, that cover. 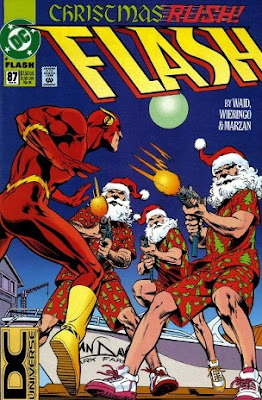 It's Flash vs an army of Santas by Alan Davis - what's not to love? On the inside it's one of those issues writer Mark Waid often conjures to seemingly convey his own pet peeves. This time, people without any Christmas spirit. Toy store burglars, drug dealing Santa cartels, public festive season greed and in-laws, all wrapped up by the interior pencils of the late, great Mike Wieringo. "Darkseid is a God and he will have your respect... in the last moments before he has your soul!" Before I left New Zealand, I sold my copies of John Byrne's Wonder Woman run, in order to make that collection more portable. Now on the other side of the Tasman I'm grabbing another copy of this issue, to relive Diana unleashing herself against an army of Parademons as Darkseid invades Paradise Island. Written and drawn by John Byrne, the comics legend brings a bit of a rougher style then his trademark look to these pages, but his plot holds more water than the recent Justice League tale of similar origins. I was a major fan of Waid's 1st run w/ the Flash, as he really stepped up the intrigue and character development for Wally at the time. My favorite storyline of course is "The return of Barry Allen." I too, like no doubt countless others, was easily fooled into thinking Barry rally did come back form the dead. To see him reveled as Prof.Zoom was very shocking at the time. And of course Waid did in such a manner, you just had to appreciate how he went about it. One favorite cover from the storyline, was #76, with Wally alone and maskless. That trap "Barry" left him at the end, and Wally's reaction was priceless. now Byrne's run on ww on the other hand I didn't like. I bought the 1st issue of his run, but stopped after that. I just didn't like how his art progressed to a scratchy mess, and his writing didn't do anything for me either. I will say this though, at least he explained the appearance of WW during the golden age. I have to admit, that was a pretty clever idea. Dale - further proof we might have been twins separated at birth, your comments reflect my own for both titles. I hated Bryne making Diana a Goddess, yet using her mother the way he did was a class act. As for Waid's The Flash, I liked how he set up the speed force and defined the legacy a lot more. It really gave Johns a lot to run with when he took over the title. 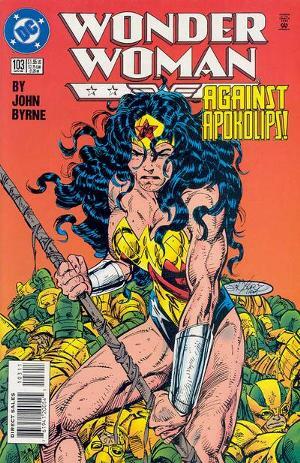 I would have liked for byrne to have done a Sensation Comics spin-off with Polly [Hippolyta] as the Golden Age WW. I did like the one-off DC did around that time - itd have been superb to see her battling Villainy Inc.
Now there's an idea worth patenting Karl - that would've been great! The one shot I loved around this time was Phil's Girlfrenzy Donna Troy issue. The talk with God was really amazing and well handled.